The organisations which will provide a range of new activities for young people and their families through the pioneering HeadStart Wolverhampton scheme have been announced. After being successful in a tendering process, three locally-based groups will deliver programmes designed to help improve the mental health and wellbeing of 10 to 16-year-olds in the four key HeadStart target areas of Wolverhampton. Place to Go will offer drop-in facilities at which young people can access trusted adults, including youth workers, on a voluntary basis to inspire them to learn new skills and extend their friendship networks. Work with Parents will offer a range of activities for parents and carers to encourage good behaviour, support learning at home, and encourage stronger bonds with their children, their school, other parents and carers and the local community. HeadStart NewsHounds will involve young people in the creation of engaging, accessible information and media content for their peers, parents and carers, and professionals, available through the HeadStart website and social media channels. Content will be designed to encourage dialogue about emotional and mental wellbeing and address the stigma around mental health issues. Bushbury Hill Estate Management Board was selected to deliver Place to Go and Work with Parents activities in Low Hill, Scotlands and Bushbury South. YMCA Black Country Group will provide Place to Go and Work with Parents activities in Heath Town, Park Village, Eastfield, Springfield and Old Heath, as well as in All Saints, Blakenhall, Parkfields and Ettingshall. Gazebo Theatre in Education will run Place to Go and Work with Parents activities in Bilston East. In addition, Gazebo Theatre in Education was selected to lead HeadStart Newshounds activities across all four of the target areas. The total awarded to the three organisations is approximately £1.4 million, and is part of the Big Lottery Fund's award of £9.47m to HeadStart Wolverhampton. The selection of the three successful organisations followed a rigorous procurement process designed to identify organisations with a proven ability to deliver creative, innovative interventions with young people and with their parents and carers ..
Councillor Val Gibson, the City of Wolverhampton Council's Cabinet Member for Children and Young People, said: "The selection of the three successful organisations followed a rigorous procurement process designed to identify organisations with a proven ability to deliver creative, innovative interventions with young people and with their parents and carers. "The HeadStart programme aims to support the emotional well-being and resilience of 10-16 year olds; these new programmes will play a critical part of realising this ambition and we are delighted to be working with Gazebo Theatre in Education, YMCA Black Country and the Bushbury Hill Estate Management Board to deliver them. "It is particularly pleasing that the successful bids came from three local organisations, demonstrating the fantastic quality of service providers we have here in the City of Wolverhampton." She added: "I would like to thank all the organisations, big and small, who submitted applications and took part in the tendering process, and to remind those that were unsuccessful on this occasion that there will be further opportunities to play a part in the HeadStart Wolverhampton programme in the coming months and years." Representatives from Gazebo Theatre in Education, YMCA Black Country and the Bushbury Hill Estate Management Board will now complete an induction process before their services for young people and parents and carers go live in the four HeadStart areas in early January. More details of the new programmes will be available on the HeadStart Wolverhampton website at www.headstartonline.co.uk in due course. HeadStart Wolverhampton, funded through The Big Lottery Fund, is a “test and learn” programme designed to improve the resilience and emotional well-being of children and young people aged 10 to 16 by giving them the skills they need to cope with life’s challenges. To find out more about HeadStart, please visit www.headstartonline.co.uk, follow @headstartfm on Twitter or follow HeadStart on Facebook at www.facebook.com/headstartfm. 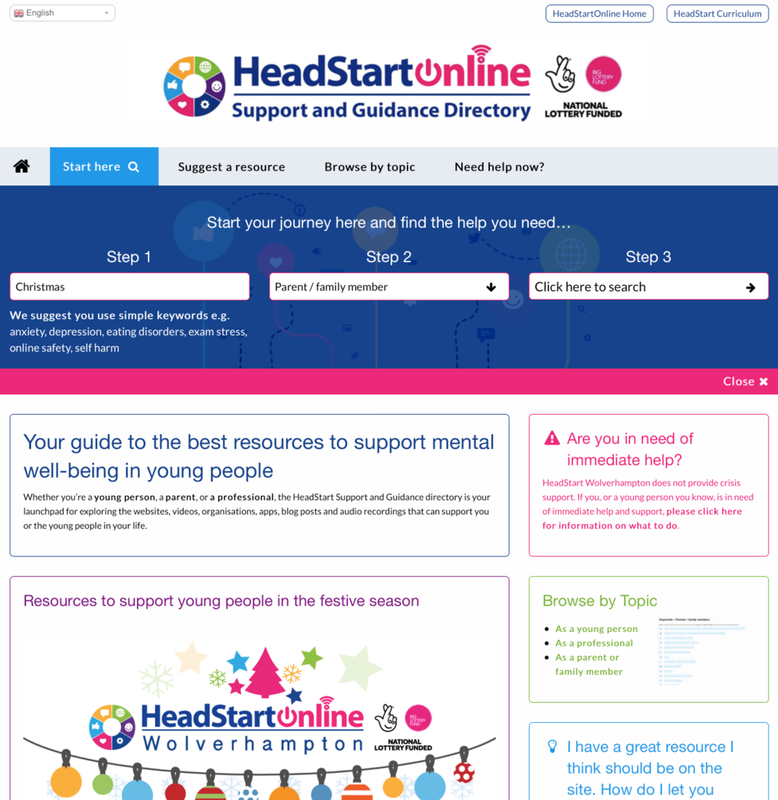 In the last few weeks, HeadStart has launched a new Support and Guidance site at http://support.headstartonline.co.uk to direct young people, parents and carers, and professionals, to selected resources to support mental wellbeing in young people.